Every Fall, the tech world starts to get excited about the arrival of the new iPhones. Loyal Apple fans gather on one side of the ring and the Apple haters on the other side, ready to fight with gloves off. At this time, I often wonder if I am an iPhone-tard or just someone who is hooked into the Apple ecosystem, unable to get out. This year, I was particularly excited about the new lineup because there were rumors of the new screen sizes including a 5.5 inch phablet. I was reading all the rumor-mills, waiting for all the key dates and generally very excited about this new iPhone. I then started to wonder, have I become an iPhonetard? As I reflect back, I think I was unknowingly put through a series of tests that would help me determine if I was an iPhonetard or not. I think the first test was the Keynote speech by Tim Cook and his team. It's a live streaming event where the new phones and other things are announced. It was right in the middle of my work day but I had to watch it. I had an early lunch, made sure all the various access methods were ready to go. Short of clapping at work when Tim Cook appeared on stage, I was fully hooked to this. I was tweeting, on Facebook, talking to my colleagues and generally very involved, even though the live cast was a bit of a disaster. Clearly, a sign of an iPhonetard. 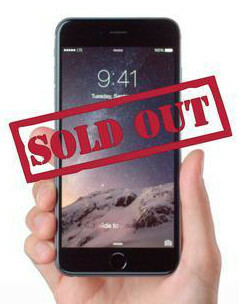 The next big test was probably the night when I could pre-order the new iPhone. I had already been to the local stores to look at alternate phones of the same size (I actually touched a Samsung Note so that should count for something) and had made up my mind to get the 5.5 phablet. While I did not wake up at the time the pre-order site went online, I did set my alarm for 2 hours later. As it turns out, the Apple site crashed and did not come back online for 2-3 hours so I was able to wake up and order my phone with a 4 week delivery window. The fact that I woke up in the middle of the night was not a good sign in my quest to find out if I had become an iPhonetard. Black Friday sales and Apple product launches are not for the faint-hearted and I have never ever stood in line for the launch of an Apple product, although I must confess I have been to a couple of Black Friday sales. With people camped out for days and knowing there was a shortage of the 6 Plus phones, I decided to pass on this. Thanks to Twitter, it was quite obvious that there was a possibility of a riot at some of these stores. Yeah for clawing back one point. About 2 weeks after the launch of the new phones, I woke up to a message from Apple that my phone was finally ready for shipping and they had given me a UPS tracking number. From the time I got that number, I was checking my phone to see where the package was. It took them almost 4 days for it to even show up at some UPS distribution center in China. From there it made its way to South Korea, Hong Kong and then to Anchorage Alaska. On the morning of October 2nd, the UPS app said "On a truck, ready for delivery". The day had finally arrived when I would have my phablet. The entire day had gone by but no sign of the phone. With 3 minutes to spare in their 7:00 PM delivery window, my new phone finally arrived at 6:57 PM. I signed for it and turned around when my mother asks "Is that the new phone you were waiting for all day?". I immediately sensed something was going to come up, and it did. She goes "Tomorrow is Dussera, an auspicious day, lets open it after doing the pooja". If we all had a personal soundtrack playing around us, you would have heard the sound of a balloon deflating. I had waited so long, whats another day and so I had to go keep the box next to the wooden temple at home. While all the events leading up to the delivery of the phone had me strongly labeled as an iPhonetard, the one act of not opening the phone for another 12 hours gave me all the points for not being an iPhonetard. I finally have started to use the new phone and its thinner, faster, bigger but honestly I don't feel the level of excitement I felt going through the events leading up to the arrival of the phone. In about 2 years, I probably will be going through this again but hopefully there is no festival on the day my phone arrives. Also, my wife pointed out that the phone is so big that I look like I can listening to one of those transistor radios from the 70s and 80s . Perhaps, I am in denial about being an iPhonetard so would appreciate any feedback. With Sachin Tendulkar having turned 40 (the big 4 O) a few days ago and, numerous articles have been written about his remarkable career. I am a fan of this great cricketer but perhaps not a super-fan like many others who know every statistic and nitty gritty detail. Having lived in Bombay, I was able follow his career from early on due his records set in the Harris Sheild and Giles Shield tournaments. He made his debut back in 1989 at the young age of 16 years and 205 days against India's arch-rival Pakistan in Karachi and announced his retirement from ODI at the end of 2012. As I was reminiscing about his career, I felt the desire to write something but any article on his stats, career, style and achievements had already been written. Perhaps it in the geek in me that felt I should write an article about how technological advancements in the 24 years since his international debut back, helped me follow his career. 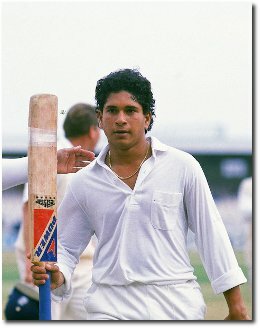 So here is my geeky look back at technology and the Tendulkar era. Good Ol' SW Radio : It must have been a rainy monsoon night when I was lying in bed hoping that this scrawny 17-year old would get his first century of his career. Back in 1990, the cable TV revolution had yet to begin in India and we only had Doordarshan. The one way to catch up on scores was to wait for the newspaper in the morning or try and catch the BBC commentary on Short Wave radio. I had all kinds of wires hooked to my window grill to get the best signal. Tendulkar was on his first tour of England and India were in trouble having lost some early wickets in the final innings of the 2nd Test. Tendulkar had put up a brave fight and was inching towards his first hundred. As he got into the 80s and 90s, it was nerve wracking just listening to the commentary and I was hoping and praying that he would get his hundred. The moment finally arrived and this young lad got his first hundred (I get goose pimples thinking about it) and saved India from a defeat. It was probably a scratchy signal but it allowed me to experience his first 100. Who knew he had 99 more centuries ahead of him. Internet Relay Chat (IRC) : For the next 3-4 years, I was able to follow his career on TV and Radio and he had blossomed into a confident batsman and was an established member of the Indian cricket team. In 1993, I left the country and with that it became harder for me to follow him. At that time, I was introduced to the Internet, which was largely used in academic circles. On our Unix workstations, there used to be an application called the Internet Relay Chat (IRC). IRC had thousands of chat rooms where you could login and chat on topics related to that channel. One of the popular rooms was #cricket where folks discussed cricket. When there was a live game, volunteers would provide live commentary of the game or regular score updates. For the next couple of years, I followed Sachin's career watching text messages as I worked on my assignment. It still remained exciting just sitting there watching text scroll by with little to no visual description of the shot but still as exciting. Willow TV and YouTube : In the decade since I left my grad school, the world wide web had grown beyond anything I would have imagined. The web was now available to people in their homes, most had dial-up services but broadband was catching on in the US. In the era of broadband communications, was born Willow TV. Willow TV allowed users to watch live video on computers via the Internet. I could now watch Tendulkar play thousands of miles away and not have to leave anything to my imagination. In 15 years, I had gone from listening to a scratchy SW radio commentary to watching him live on streaming video. By 2010/2011, YouTube was a sensation and was now Willow TV and YouTube were streaming cricket in High Definition. Smartphone : With the launch of the iPhone, smartphone innovation took off in 2007/2008. Smartphones became more than phones and became multi-function devices where you could even watch TV. Willow TV started offering a mobile app allowing me to watch my cricket games anywhere I was. Almost 25 years later, I find myself in bed again but I am watching a crystal clear HD picture of the Little Master play. Times have changed, technology has changed but I get the same chill every time he plays and gets close to a 100. Agonizing as it was, he finally got his 100th 100. Sachin Tendulkar is a rare sportsman who is not only amazingly gifted and talented, but very humble. In almost 25 years, this man has achieved every possible feat in the sport while technology has allowed me to follow this great sportsman from a scratchy audio signal on a radio to a crystal clear High Definition picture. Which achievement is bigger, Tendulkar's or the progress of technology? I leave it to you to decide.